The interior material palette has been selected to showcase bespoke style and comfort, away from the hustle and bustle of the area. 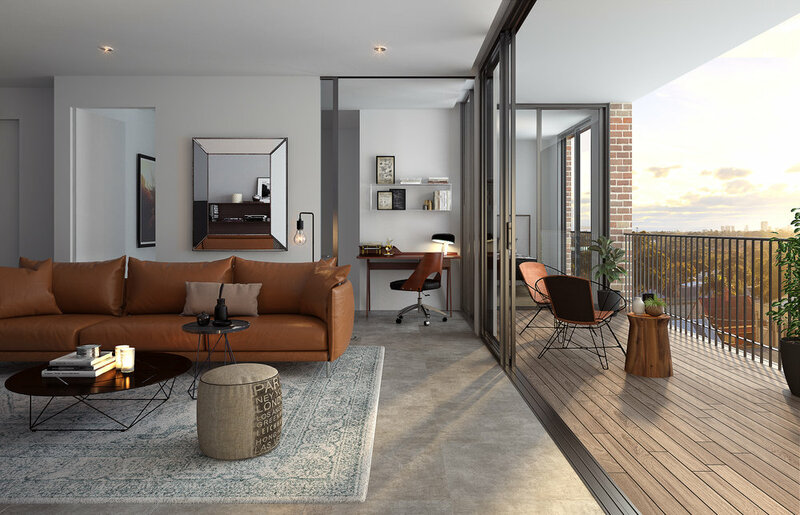 Polished concrete floor covering runs throughout the general living and dining areas of the apartments, complemented by the warm timber finishes of the kitchen and cupboard joinery. The kitchen features stylish Smeg appliances, crafted bench tops, latest feature-tiled splash backs and abundant storage. Sleek, distinctive and modern bathrooms are achieved through the selection of specialty Astra Walker tap ware against feature and large format tile across the general and penthouse schemes. Parquetry flooring to Penthouse units complement cutting edge Laminam ceramic slab bench tops, adding luxurious and majestic vibes to the development.